In Haiti, the maternal and infant mortality rate is the highest in the western hemisphere ~ and that was before the earthquake. This high mortality rate, 1 in 5 for every child under 5 and 1 in 12 for every laboring mother, was what moved me to action last May. For almost 1 year now, I have been leading an effort to assist women and children in Haiti. The Haiti Initiative Service, as it is named, has raised approximately $50,000 since I took over in May 2009. You can visit Music4Haiti.org for more information on the work. After the earthquake, our first disaster relief projected was organized through UMCOR. Over 400,000 health kits have been collected and assembled through since January 13, 2010. Now our focus must shift to meet the great needs of Haiti’s women and children. I have been planning to coordinate assembling and shipping Newborn and Birthing Kits to local health clinics and hospitals in time for Mother’s Day/Spring since July 0f 2009. Not ironically, and with obvious Divine timing, UMCOR now states these kits are what are needed MOST in Haiti. You can easily help improve maternal and child health now. Decide which kit you would like to assemble. Bonus! If you are in Eastern North Carolina, drop off points are at Emerald Isle Parks & Recreation Department and Swansboro United Methodist Church. Thank you for continuing to help those who need the most help in Haiti – birthing mothers and their newborns. 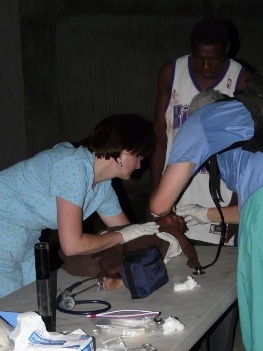 *This photo was taken by one of our own NC aide workers in Haiti – as night fell on the pictured medical aide workers on January 12, 2010, the day of the earthquake. The doctors and nurses on this team worked through the night, until they had completely exhausted all medical supplies. The photo shown is an infant being attended to after the earthquake, as likely a family member stood by watching. I post this photo only out of great respect for the needs of Haitian women and children – and to maintain awareness as media coverage of the great need in Haiti begins to wane.